Bought NXT Pro 3 on April 2, 2015. While trying to burn from MY DVD I get the Drive Is Empty notice using Windows 7. I tried to get help but they are closed Thursday and Friday for Good Friday.. Monday, I need a code to get a one time free support in the first 14 days of ownership. I called the sales number to say I never got a code. I bought it from Roxio online and they say the code in in the receipt email. No it is not. So I buy a one time telephone support for $25fso I can talk to them. After I explained it to him he said he will not charge this call against it and it is good for a year. No refund. We tried a few things that did not work. He escalated it to the next tier of support. Are you getting the "drive is empty" status message in the "Burn Project" window of the Roxio MyDVD ("Create DVDs") program? If so, have you tried to burn a data disc project to see if it works? See if saving your MyDVD project to a disc image first, and then burning the saved disc image to DVD later, will work. Please refer to the link below for instructions on how to create a disc image and burn it to DVD. The reason I asked about whether you are able to burn a data disc, or save a disc image of your MyDVD project and burn it, is because the "drive is empty" issue is a known issue that has no existing fix at this point for computers that are affected. This issue has already been reported to our Engineering department, but we have not received any feedback at this time as to how this problem can be corrected. All we can provide is the disc image work-around, stated above. Another work-around is to use an external USB DVD writer. I called back in and a nice guy said he could get me refunds but he would send me links in email because I had to do it myself. I filled out both forms online and removed the software and ageed to destroy it and got my refunds in a couple of hours. 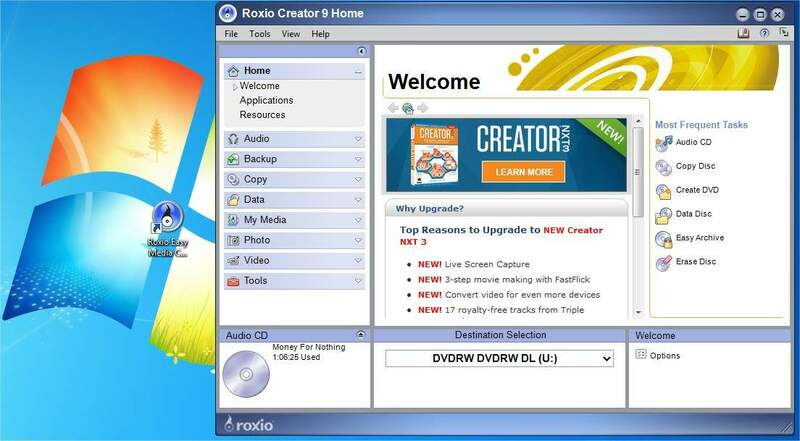 I previously used Roxio Easy Media Creator 9 on a Windows XP machine and really liked it but it will not run in Windows 7. My Windows 7 computer is maybe 6 months old,I don't want Win 8, and I even bought another DVD drive. One of their techs said he thinks my DVD drives are too new for their software. Now I'm stuck using cheap software I do not like. PLEASE FIX YOUR SOFTWARE. Also, If they knew about this for years maybe the first support tech should have told me right away instead of have me wait at home a day and a half so not to miss the phone call that never came that I paid for. A person would think that this would be in the tech database of questions. I feel your pain and agree with you. This problem has had a number of us 'frequent users' pulling our hair out - about both the current support system and the lack of feedback from the technical people in Roxio - and it's hair we can ill afford to lose. MyDVD's failure to recognize a disc in the drive seems to strike only a very few 64-bit Windows systems, and we here on the Board have tried to find a common factor among the faulting systems but couldn't so we reported it to Roxio. The reports were passed on but nothing has come back down here. Much later there still isn't a solution to this problem with MyDVD, only the workaround. Looking in another direction altogether, you said Easy Media Creator 9 wouldn't run in Windows 7. Did you try a 'custom' install without Drag To Disc selected? I have it running on one of my Windows 7 machines. Jolafson even went as far as sending me his drive because I have never suffered from the missing drive. When I installed his drive my system had no problem seeing it in any Roxio NXT2 and NXT3 application! We came to a conclusion it's a combination of PC make, I build my own boxes, and or the configuration consisting of hardware and software installed on the systems that don't see a drive. No help to you just trying to explain what we have done as users and the results. Tried to install Easy Media Creator 9 on a Windows 7 64bit. Under Custom I could not find Drag to Disk to de-select it. I got and error. I removed anything that had to do with Roxio or Corel and ran a registry cleaner. Rebooted and some error. I went back to that machine to check how I'd done it at install time, and I'd removed the old Drag-to-Disc after install but before rebooting. Mine is running under 32-bit Windows 7. I'm sorry if that gave you some false hope for running EMC 9 under x64 Win 7. Thank you for checking. I hope when they figure out fix the Drive is Empty problem that affects some of the Windows 7 64bit users they will post it here and I would buy it again. I reckon the moment we hear a solution for that one, we'll have to have a big party here on the Board.!! When trying to burn in Roxio NXT 3. Has Roxio ever come back with a solution? Did you try the things in the Link that cdanteek provided in Post #4? Worth reading. Some simple trip-ups that one can make is trying to use a CD when a DVD is required or the opposite. Same for BD.